Don is a “cat person,” and I am a “dog person.” When we moved in together, I had two dogs and a cat, who I loved wholeheartedly but who definitely played third fiddle to my dogs. And Don had one very cool charcoal gray cat named Darden. Don’t get me wrong; we both love the other species, but if we had our druthers, historically Don would’ve stuck with cats and I dogs. Three years ago, after we lost one of my dogs and both of our cats, Don and I adopted our first pet together, a cat we named Sammy. After falling in love with this handsome tabby, who is absolutely the sweetest feline fellah I ever met, I will forever more consider myself an equal opportunity pet lover. But despite the fact that we still had our girl Ava at the time and she absolutely worshipped Don (more than me, I think), I would say that Don was still a “cat person” through and through. 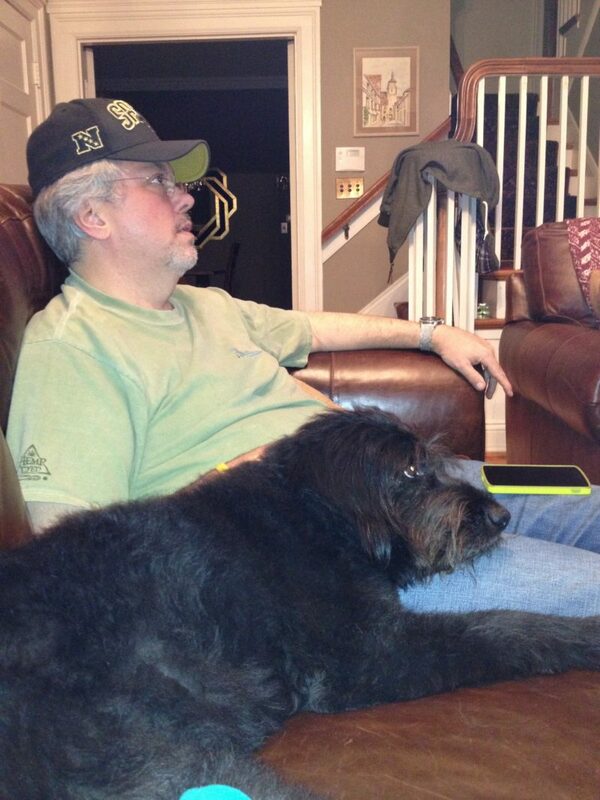 Now that we have the pups, Don has renewed hope for a furry, live-in football buddy. Archie already understands the rudiments of fetch and is the best snuggler you’ll ever meet. On the other hand, Daisy is channeling Ava in her love of her Daddy, staring adoringly up at him every time he takes his place on the couch in my office. (Seriously, I think Don gives off pheromones to female dogs!) Maybe she’ll enjoy sharing the recliner and watching–and barking at–the plays with her old man! Bottom line, they both see Don as the “Big Dog” and, after witnessing quite a few cracks in his steely “cat person” armor, I see small signs (like when he admitted to showing their picture to his work friends) of Don bonding with them too. Maybe Don’s not a bonafide “dog person” yet, but I’d say, “Just give it time.” Maybe by next year’s football season!